Spring of 1830: Margaret Macdonald's private handwritten account stated "I felt this [pre-Antichrist rapture] needed to be revealed." Fall of 1830: Rev. Edward Irving's journal was the first publication to publicly teach the new pretrib rapture idea. 1833: British lawyer Robert Baxter revealed that "the [pretrib] delusion first appeared in Scotland" and was soon "adopted and upheld by Mr. Irving." 1834: After seeing pretrib introduced in Irving's journal, a letter Plymouth Brethren leader John Darby wrote described the new escapist doctrine by stating that "the thoughts are new." He also advocated the subtle sneaking in of the new view into other (Brethren) groups when he wrote "ordinarily, it would not be well to have it so clear, as it frightens people [who have] been trained in most opposite habits." 1842: Darby wrote that "There is much blessing in Switzerland, but a little commotion, because of the new [pretrib] wine, which does not suit well with the old bottles...."
1843: In a letter Darby gloated that the Swiss Christians were rapidly accepting the pretrib rapture "without knowing whence it came or how it sprung up all of a sudden" - that is, not knowing how he had quietly stolen the idea from Irving and his followers! 1861: Dr. Robert Norton (who had married Margaret in 1835) described her history-making 1830 pretrib revelation by writing "here we first see the distinction between that final stage of the Lord's coming, when every eye shall see Him, and His prior appearing in glory [before Antichrist's arrival] to them that look for Him." 1864: British scholar S. P. Tregelles wrote that pretrib was "first brought forward...about the year 1832." 1872: Thomas Croskery wrote that pretrib "was never heard of till it was proclaimed...in 1832." 1918: E. P. Cachemaille traced the pretrib origin to someone in Irving's circle in the early 1830s, adding that "there has since been much scheming to give the doctrine a reputable origin, scheming by those who did not know the original facts"! 1922: Canadian theologian Robert Cameron wrote that "the whole body of Christians, prior to the days of Edward Irving, were a unit in believing that the Church would not escape the Tribulation." 1927: Philip Mauro wrote: "...'dispensational teaching' is modernistic in the strictest sense...it first came into existence within the memory of persons now living..."
1936: Darby defender Napoleon Noel wrote that Darby "was first and foremost in teaching...the Rapture...."
1937: Alexander Reese wrote that the " 'any-moment' view of Christ's return only originated about 1830." 1957: In his book "The Rapture Question" (p. 162), top Darby defender John Walvoord, unable to find any pretrib teacher before the 1830s, described Darby as one of the "early pretribulationists"! When I began my pretrib origin research more than 45 years ago, historians had long traced pretrib back to John Darby and the 1830s. It wasn't until my research uncovered long forgotten evidence in libraries in Britain etc. (that Darby had been preceded by the Irvingites as well as Margaret) that pretrib protectors began desperately to claim they'd found pretrib earlier in the writings of Morgan Edwards (1788) and Pseudo-Ephraem (7th cent.?). Online articles condemning these and other claims for pretrib include "Morgan Edwards' Rapture View," "Pseudo-Ephraem Taught Pretrib - Not," and "Grant Jeffrey's Apocalypse Debacle." What you've just read is a tiny part of my most comprehensive 300-page book on pretrib rapture history titled "The Rapture Plot" - available by calling 800-643-4645. I should add that it isn't hard to find persons attempting to write about the past - especially if they adopt the hysterical method more than the historical method! What They Are Saying About ... 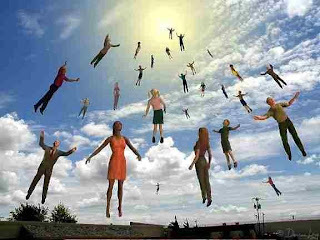 THE RAPTURE PLOT! Gary DeMar (President American Vision): "A majority of prophecy writers and speakers teach that the church will be raptured before a future tribulation period. But did you know that prior to about 1830 no such doctrine existed. No one in all of church history ever taught pretribulational rapture. Dave MacPherson does the work of a journalistic private investigator to uncover the truth....The Rapture Plot is the never-before-told true story of the plot - how plagiarism and subtle document changes created the 'mother of all revisionisms.' A fascinating piece of detective work." Robert H. Gundry (Professor Westmont College): "As usual MacPherson out hustles his opponents in research on primary sources. 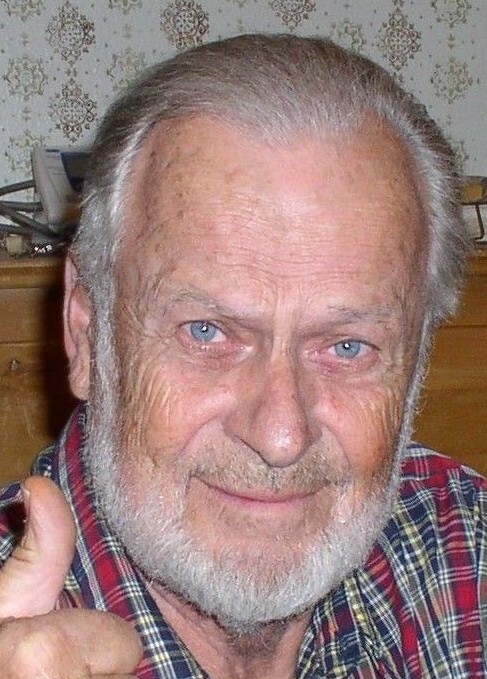 C. S. Lovett (President Personal Christianity): You don't read very much of Dave MacPherson's work before you realize he is a dedicated researcher. 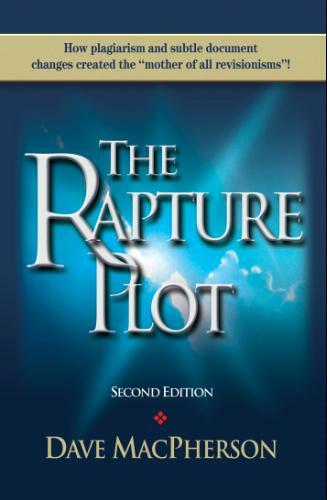 Because his work has been so honest and open his latest work The Rapture Plot has produced many red faces among some of the most recognized rapture writers of our time. When their work is compared to his it is embarrassing for them to see how shallow their research is." R. J. Rushdoony (President Chalcedon): "Dave MacPherson has been responsible for major change in the eschatology of evangelical churches by his devastating studies of some of the central aspects thereof. 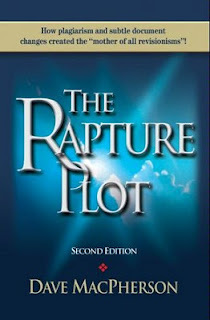 In The Rapture Plot MacPherson tells us of the strange tale of 'rapture' writings, revisions, cover-ups, alterations and confusions. No one has equaled MacPherson in his research on the 'pretrib rapture.' 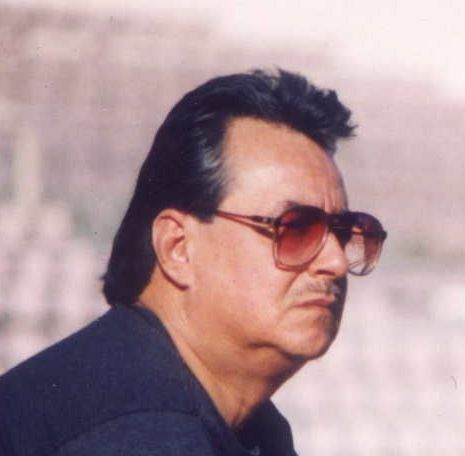 Attempts to discredit his work have failed...."